By Robert Pyke Ph.D., G.E. Because of the difficulties noted in a companion article about the limits of limit equilibrium methods of slope stability analysis, it is worth re-examining the Ordinary Method of Slices (OMS) in which interslice forces are neglected – which is similar to assuming a frictionless contact between adjacent slices. The OMS does not require an iterative solution so that convergence and multiple solutions are no longer issues. The OMS, as described for instance by Duncan, Wright and Brandon (2014), and also sometimes referred to as the Fellenius or Swedish Circle Method, uses moment equilibrium about the centre of a circular slip surface and the factor of safety is defined as the sum of the resisting moments divided by the sum of the driving moments. A similar method can be extended to non-circular slip surfaces if the factor of safety is defined as the sum of the resisting forces around the failure plane divided by the sum of the driving forces. These driving and resisting forces are computed as stresses that are normal and parallel to the base of each slice. The sums of these forces do not make much sense if they are added arithmetically, but if they are added as vector sums, they do. In the early days of slope stability analyses such vector additions were done graphically but now they can be done by computer using modern programming languages. In addition to having the virtue of simplicity, the OMS also effectively accounts for the deformable nature of soil and rock masses and allowing the slices to slide up and down relative to each other, while still not physically correct, is generally more consistent with reality than assuming that the entire potential sliding mass is a rigid body. The assumption of a rigid body is really only realistic when the slip surface is either circular or a logarithmic spiral, but even then the potential sliding mass is likely deformable. For non-circular slip surfaces, which are not kinematically admissible, the assumption of a rigid body is unrealistic and may often lead to overly conservative results. Even wedges of rock mass, for which special analysis techniques have been developed in rock mechanics, and for which failures are kinematically admissible, are rarely if ever single unjointed and unfractured blocks of rock. The OMS has been criticized and fallen out of favour in recent times at least partly because of a widely quoted example contained in the otherwise excellent paper by Whitman and Bailey (1967). 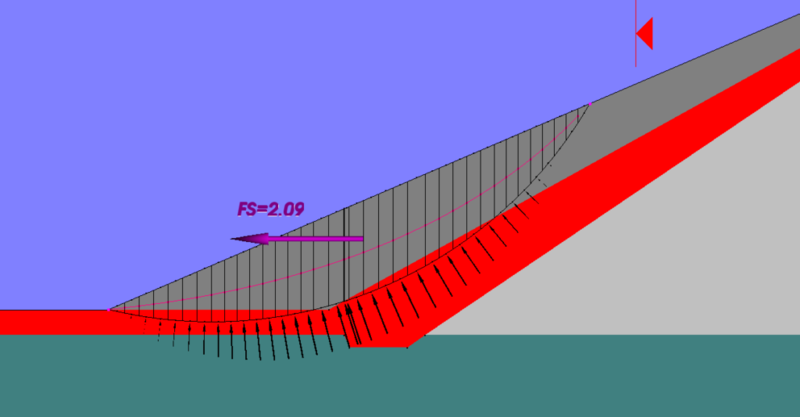 This example consists of the analysis of the submerged upstream slope of an inclined core dam and is reproduced below. Whitman and Bailey, and Duncan, Wright and Brandon (2014), and others before them, correctly pointed out a problem, that actually applies to all analyses by the Method of Slices, but can be seen more clearly in the OMS. If the normal effective stress on the failure plane is computed by taking the component of total weight of the slice, and any water above it, normal to the potential slip surface and then subtracting the pore pressure that acts on the base of the slice, when either or both of the angle of inclination of the base of the slice and the pore pressure are large, the calculated normal effective stress can be less than zero. The problem is illustrated and discussed in more detail by Pyke (2017a). However, Whitman and Bailey and Duncan, Wright and Brandon, and, again, others before them, also suggested a solution to this problem which is to use the buoyant unit weight of the slice in calculating the weight of the slice and the component normal to the base of the slice. Pyke (2017a) explains that not only does this solve the problem, but that it is the “more correct” solution, and that under non-hydrostatic conditions the buoyant unit weights need to be adjusted for any seepage forces in the vertical direction. This can most easily be done in practice by going back to using the total unit weights but applying the water pressures in the vertical direction that act on the base and the top of the slice. The computer program TSLOPE, which offers two methods of solution, the Ordinary Method of Columns (OMC), which is equivalent to the OMS in 2D, and a unique 3D solution for Spencer’s Method, can be used to explore this problem. Spencer’s Method assumes that the angle of inclination of all the interslice forces is the same. This is obviously not correct, but Spencer’s Method converges more reliably than the Morgenstern and Price Method, and even with the theoretically nicer Morgenstern and Price method, the user has to check that a valid line of thrust and a solution without tension is obtained, in addition to struggling with what distribution of interslice forces to use in the first place. The solution for Spencer’s method in TSLOPE uses an optimization technique that in fact always converges and the final imbalance in the moments and forces (if any) can be seen by the user. The user can also view a 3D surface that shows the variation in the factor of safety with respect to other variables so that it can be confirmed that the appropriate minimum value has been found. Because the OMC provides a direct calculation of the factor of safety and has no convergence issues, even if Spencer’s method is specified, TSLOPE initially calculates the factor of safety using the OMC and then uses this value and the direction of sliding (for a 3D analysis) as the starting point for the calculation by Spencer’s Method. The OMC, as implemented in TSLOPE, is generally similar to the method for 3D analysis of slopes described by Hovland (1977) in which inter-column forces are neglected and driving and resisting forces are computed parallel to the bases of the slices or columns. The factor of safety in TSLOPE is defined as the vector sum of the resisting forces divided by the vector sum of the driving forces. The normal effective stresses on the potential failure plane are calculated as discussed above. The results obtained using TSLOPE for two variations of Whitman and Bailey’s Example 4, shown in their Figure 11, are shown in Figure 3 and Table 3 [the figure and table numbers in this article are the same as those in a longer report, Pyke (2017b), from which this article has been extracted]. Figures 3(a) and (b) show the original Whitman and Bailey problem with the pond level close to, but not quite at, the top of the core. Figures 3(c) and (d) have the pond level brought down to the top of the potential sliding mass. It can be seen from the figures that lowering the pond level makes no difference to the factor of safety, as should be the case for hydrostatic conditions and a fully submerged potential sliding mass. The factor of safety computed by Spencer’s Method is 2.09. Because much of the potential failure surface passes through the core which includes significant cohesion and the distributions of normal stresses are not that different, the corresponding factors of safety by the OMC are only 8 percent lower at 1.93. Whitman and Bailey obtained factors of safety ranging from 2.01 to 2.03 using the Morgenstern and Price method, which they considered to be the “most correct” solution. These values are consistent with the answers from TSLOPE given that the details of the geometry that we have read from their figure may not be precisely correct. It might also be noted that these results are not for the critical slip circle as we are just using the circle adopted by Whitman and Bailey. For that circle, Whitman and Bailey obtained a factor of safety of 1.84 by the Fellenius Method, which is generally considered to be the same as the OMS, when using buoyant unit weights. This answer is not dissimilar to the answer given by TSLOPE and differs from their “most correct” solution by only 9 percent. If Whitman and Bailey had emphasized the point that this is the “more correct” way of conducting a Fellenius or OMS analysis, the OMS would have been cast in an entirely different light. However, instead of doing that, they placed great emphasis on the factor of safety of 1.14 that they obtained using the Fellenius Method with total unit weights, which was only 57 percent of their “most correct” solution. The details of their programming are unknown and we have not been able to reproduce that number, but that is not critical. The critical point is that if Fellenius or the OMS is used with the “more correct” way of handing unit weights and pore pressures, it gives factors of safety that are not inconsistent with limit equilibrium methods, and that differ only because of the difference in the distribution of effective stresses around the slip surface, at least for problems without seepage forces, applied loads or internal reinforcing. These factors can introduce more significant differences depending on how they are handled.